Whew. I dodged a humongous fail this weekend with the bookcases. 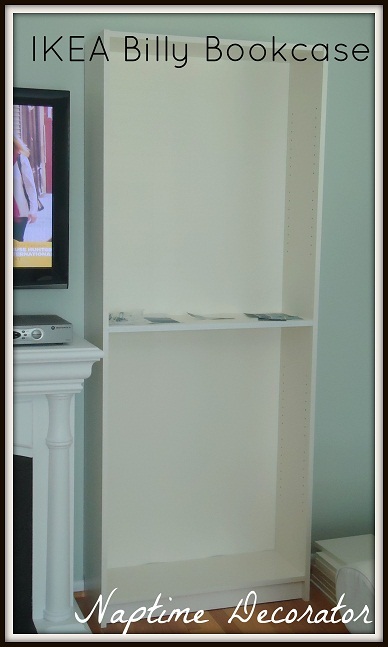 If you’re up-to-date with the whole Family Room Makeover happenings, you know we recently moved the tv to another wall, painted the fireplace white, and purchased two Billy Bookcases from IKEA to flank them. 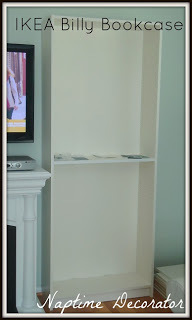 Our plan is to fancy ’em up, add molding, paint the back a darker color, you know, kinda mimic the whole built-in look without actually getting built-ins. But I had the genius idea to line the backs with beadboard wallpaper first..or so I thought it was genius. Sure, add some more texture, it’ll look awesome. AND I even had some leftover from the kitchen backsplash. Perfect, right?! And started painting. Here’s where I had my first (yes, first) ACK! attack. Crossed my fingers, hoping that once it dried, it wouldn’t look so bumpy. Nope. Just as bumpy dry. Apparently that little bit of not gluing flush against the bumpy back of the bookcase was even more evident with a dark color on there. Yikes. So I ripped it all down. I decided to just paint the backs. I had read blogs where they painted these exact bookcases, and just need to prime it first, and the paint will go on great. Perfect! Sure, the beadboard would have looked great, but this’ll look fine too, right? It would. not. stick. You know when you try to paint a super glossy surface, and it just disappears in spots, and won’t stay on? Yup. That was happening. All over. It was not pretty. I looked at my husband, who was so sweetly watching football at the time, and he was encouraging me, but later told me he didn’t think I had a chance in you-know-where of these turning out! We both kinda thought we’d just have to put beadboard wallpaper back up there and just not paint it. Turns out the glue from the wallpaper made this surface pretty much unpaintable. I tried cleaning the surface, hoping to remove the residue, but it wasn’t working. So the primed surface wasn’t working. The cleaned surface wasn’t doing the trick either. Hmm…Plaster and paint! YES! That stuff sticks to anything! I added a little plaster of paris to my paint to get the stick-to-anything paint going. It started going on a little bit better, but not much. I then came up with this bizarre technique. A minute or so after I applied the disastrous first coat, I took a paper towel and sorta smeared the paint around. I let it dry, hoping it would somehow act as a base coat and the paint would stick to it. And wouldn’t you know it? It WORKED. 1. ALWAYS prime your surface if the instructions say PRIME YOUR SURFACE! 2. Where there’s a will, there’s most definitely a way. Especially if you’re a little cuckoo for Cocoa Puffs, like yours truly. 3. These bookcases might be the death of me. 4. These bookcases are gonna look freakin’ awesome once the molding/shelves are put in, and they’re all styled. So there’s the story of my crazy painting Fail-turned-Success. It was a little iffy for a while there yesterday, but it all worked out in the end;). We bought the molding to get started on that next weekend! Yippee! Keep ya posted!